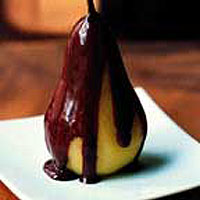 A dark and dramatic coating of chocolate over freshly poached pears makes an elegant dinner party pudding. Wash the pears and place upright in a small, deep saucepan so they fit snugly. Cover with cold water to measure the amount of water you'll need for the syrup, then remove and reserve the pears. Add the sugar, cinnamon stick, bay leaf and peppercorns to the water and bring to the boil, stirring. Remove from the heat. Peel and core the pears from the base, leaving the stalk intact, and rub with the cut lemon. Place the pears upright in the syrup, and gently simmer, uncovered, for 15-20 minutes until just tender when pierced with a thin bamboo skewer. To make the sauce, place the cream, butter and sugar in a small pan and heat gently, stirring, until hot but not boiling. Remove from the heat, add the chocolate and stir until smooth. Drain the pears and arrange on plates. Pour the chocolate sauce over the pears, including the stem, until lightly coated. Serve immediately, with the remaining chocolate sauce and mascarpone or cream. To avoid wobbly pears, trim a thin slice from each base so that they stand upright. You can make the sauce in advance and reheat. This recipe was first published in Wed Sep 01 01:00:00 BST 2004.